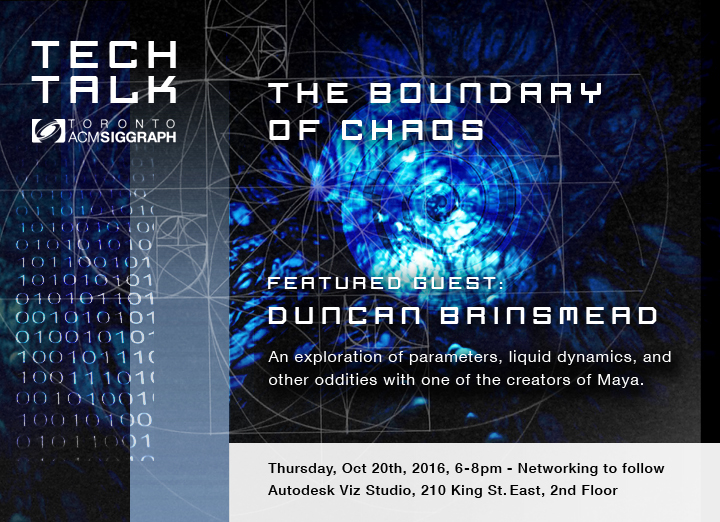 On Thursday October 20th, 2016 Toronto ACM SIGGRAPH was pleased to host Duncan Brinsmead for his talk “The Boundary of Chaos”. Duncan’s contributions to Maya include Bifrost fluids, the Nucleus Physics Solver (along with Jos Stam) and Maya Paint Effects. Duncan’s talk started off by examining how seemingly simple scripts in Maya — when placed in repetition — can generate complicated and visually stunning imagery. He then proceeded to show how combining fluids with solid geometry can produce interesting and otherworldly environments. This was followed by demonstrating how these environments can drastically change in fascinating ways by only tweaking a handful of parameters in Maya. Of special note was the fact that how the most interesting of outcomes are usually arrived at when these parameters are tweaked on the boundaries of creating chaos within the editor. Finally, Duncan demonstrated the flexibility of motion trails in Maya and how they can be used to drive fluids in interesting ways. He then used this technique combined with a 3D model of a dolphin to demonstrate how fluids in Maya can take on any form in their journey from one location to another. The talk ended with a Q&A session where attendees asked questions regarding their thoughts on the techniques presented and inquired about potential future enhancements in Maya. We all then gathered at Betty’s for some food and good cheer where attendees finally had the chance to meet Duncan personally and ask any questions they had remaining from the talk. We would like to thank everyone who attended and all the volunteers that made this event possible! Thank you and we hope to see everyone again at our future events!